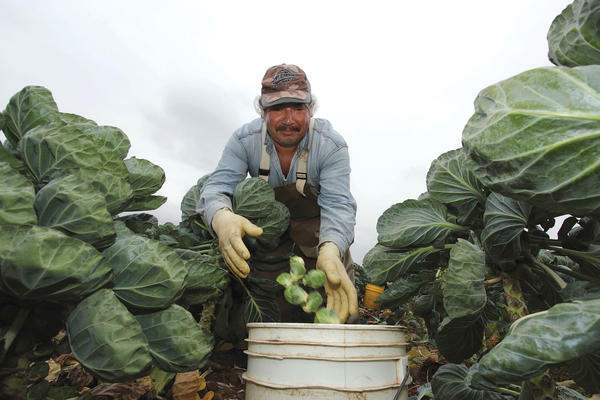 Workers are paid a piece rate corresponding to the amount of sprouts they harvest. Photo by David Bacon. In the late 1970s, the U.S. Congress began to debate the bills that eventually resulted in the 1986 Immigration Reform and Control Act (IRCA) — still the touchstone for ongoing battles over immigration policy. The long congressional debate set in place the basic dividing line in the modern immigrant rights movement. IRCA contained three elements. It reinstituted a guest worker program by setting up the H2-A visa category; it penalized employers who hired undocumented workers and required them to check the immigration status of every worker; and it set up a one-time amnesty process for undocumented workers who were in the country before 1982. Guest workers (i.e. workers whose immigrant status was tied to temporary, specific jobs), employer sanctions, and some form of legalization still occupy the main floor of the debate. The AFL-CIO supported sanctions, believing they would stop undocumented immigration (and therefore, presumably, job competition with citizen or legal resident workers). Employers wanted guest workers. The Catholic Church and a variety of Washington DC liberals supported amnesty and were willing to agree to guest workers and enforcement as a tradeoff. Organized immigrant communities and leftist immigrant rights advocates opposed the bill, as did local labor leaders and activists, but they were not strong enough to change organized labor’s position nationally. The Washington-based coalition produced the votes in Congress, and on November 6, 1986, Ronald Reagan signed the bill into law. Once the bill had passed, many of the local organizations that had opposed it set up community-based coalitions to deal with the bill’s impact. In Los Angeles, with the country’s largest concentration of undocumented Mexican and Central American workers, pro-immigrant labor activists set up centers to help people apply for amnesty. That effort, together with earlier, mostly left-led campaigns to organize undocumented workers, built the base for the later upsurge of immigrant activism that changed the politics and labor movement of the city. Elsewhere, local immigrant advocates set up coalitions to look for ways to defend undocumented workers against the impact of employer sanctions. Grassroots coalitions then began helping workers set up centers for day laborers, garment workers, domestic workers, and other groups of immigrants generally ignored by established unions. Over the years since IRCA, a general division has marked the U.S. immigrant rights movement. On one side are well-financed advocacy organizations in Washington DC, with links to the Democratic Party and the business community. They formulate and negotiate immigration reform proposals that combine labor supply programs and increased enforcement against the undocumented. On the other side are organizations based in immigrant communities, and among labor and political activists, who defend undocumented migrants, and who resist proposals for greater enforcement and labor programs with diminished rights. In the late 1990s, when the Clinton administration acquiesced in efforts to pass repressive immigration legislation (what eventually became the Immigration Reform And Immigrant Responsibility Act), Washington lobbying groups advocated a strategy to allow measures directed at increasing deportations of the undocumented to pass (calling them “unstoppable”) while mounting a defense only of legal resident immigrants. Many community-based coalitions withdrew from the Washington lobbying efforts, refusing to cast the undocumented to the wolves. Over the past decade, a succession of “comprehensive immigration reform” (CIR) bills have been introduced into Congress. 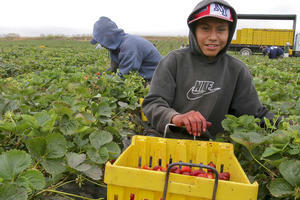 At their heart are the guest worker programs proposed by employers. But while the employer lobbies wrote the first bills, they have been supported by a political coalition that includes some unions, beltway immigrant advocacy groups, and some churches. Except for the vacillating and divided position of unions, this is the same political coalition that passed IRCA in 1986. Some local immigrant rights coalitions have also supported the bills, although many others have been unwilling to agree to guest worker programs and more enforcement. Supporters of the comprehensive bills have organized a succession of high-profile lobbying efforts, which received extensive foundation support. The structure of the bills has been basically the same from the beginning—the same three-part structure of IRCA—guest workers, enforcement, and some degree of legalization. Under the CIR proposals promoted by Washington advocacy groups for several years, people working without papers would continue to be fired and even imprisoned, while raids would increase. Vulnerability makes it harder for people to defend their rights, organize unions, and raise wages. That keeps the price of immigrant labor low. Enforcement does not stop people from coming to the United States, but it does produce a much larger detention system. Last year over 350,000 people went through privately run prisons for undocumented immigrants, while over 409,000 were deported. The Washington-based CIR proposals all expand guest worker programs, in which workers have few rights, and no leverage to organize for better conditions. Finally, the CIR legalization measures impose barriers making ineligible many, if not most of the 11 million people who need legal status. They condition legalization on “securing the border,” which has become a Washington DC euphemism for a heavy military presence, augmenting 20,000 Border Patrol agents and creating a climate of wholesale denial of civil and human rights in border communities. A loose network of groups has grown that has generally opposed most CIR bills and their provisions, and that has organized movements on the ground to oppose increased enforcement and repression directed against immigrant communities. Outside the Washington beltway, community coalitions, labor and immigrant rights groups are pushing for alternatives. Some of them are large-scale counters to the entire CIR framework. 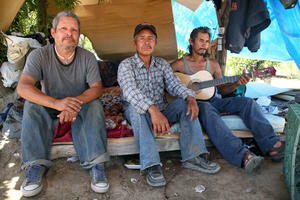 Others seek to win legal status for a part of the undocumented population, as a step towards larger change. Many support the call for a moratorium on deportations. One of the alternative proposals is the DREAM (Development, Relief, and Education for Alien Minors) Act. First introduced in 2001, the bill would allow undocumented students graduating from a U.S. high school to apply for permanent residence if they complete two years of college or serve two years in the U.S. military. For seven years thousands of young “sin papeles,” or people without papers, marched, sat-in, wrote letters, and mastered every civil rights tactic to get their bill onto the Washington agenda. Many of them have “come out,” declaring openly their lack of legal immigration status in media interviews, defying authorities to detain them. The DREAM Act campaigners did more than get a vote in Washington. They learned to stop deportations in an era in which more people have been deported than ever since the days of the Cold War. When it was originally written, the bill would have allowed young people to qualify for legalization with 900 hours of community service, as an alternative to attending college, which many can not afford. However, when the bill was introduced, the Pentagon pressured to substitute military for community service, though even with that change, Congress did not pass the bill. In the heat of the 2012 presidential campaign, however, “dreamers” sat in at President Obama’s Chicago reelection office and demonstrated nationwide, leading Obama to issue an executive order “deferring” the deportation of DREAM Act-eligible young people. Today, many immigrant rights activists view the DREAM Act as an important step towards a more basic reform of the country’s immigration laws, and also see the dreamers’ strategy as proof that absent Congressional action the administration has the ability, if not the political will, to end mass deportations. Supporting the DREAM Act and other partial protections for the undocumented are worker centers around the country. Worker centers have anchored the protests against repression in Arizona, and fought to pass laws in California, New York, and elsewhere, prohibiting police from turning people over to immigration agents. They have developed grassroots models for organizing migrants who get jobs on street corners. These projects have come together in the National Day Labor Organizing Network. The National Domestic Worker Alliance was organized in part using the experience of day labor organizing, to win rights for domestic workers, almost all of whom are women. It won passage of a domestic worker bill of rights in New York and California. Other projects organize groups with a large immigrant contingent, from taxi drivers to garment workers. The FIOB proposal on immigration reform is similar to that advanced by the Dignity Campaign, a loose coalition of organizations around the country that has proposed an alternative to the comprehensive labor-supply-plus-enforcement bills. The Dignity Campaign brings together immigrant rights and fair trade organizations to encourage each to see the global connections between trade policy, displacement, and migration. Photo by David Bacon.The group also brings together unions and immigrant rights organizations to spur the growth of resistance to immigration enforcement against workers, highlighting the need to oppose the criminalization of work. The Dignity Campaign proposal draws on previous proposals, particularly one put forward by the American Friends Service Committee called “A New Path”—a set of moral principles for changing U.S. immigration policy. Several other efforts were also made earlier by the National Network for Immigrant and Refugee Rights to define an alternative program and bring together groups around the country to support it. The critique shared by all these organizations is that the CIR framework ignores trade agreements like NAFTA and CAFTA, which have undercut workers’ bargaining power and employment opportunities in Mexico and Central America. Without changing U.S. trade policy and ending structural adjustment programs and neoliberal economic reforms, millions of displaced people will continue to migrate, no matter how many walls are built on the border. Changing corporate trade policy and stopping neoliberal reforms is as central to immigration reform as gaining legal status for undocumented immigrants. There is a fundamental contradiction in the bipartisan policies in Congress that promotes more free trade agreements, and then criminalizes the migration of the people they displace. Instead, Congress could end the use of the free trade system as a mechanism for producing displaced workers. That would mean delinking immigration status and employment. If employers are allowed to recruit contract labor abroad, and those workers can only stay if they are continuously employed (the two essential characteristics of guest worker programs), then they will never have enforceable rights. The root problem with migration in the global economy is that it is forced migration. A coalition for reform should fight for the right of people to choose when and how to migrate. Freedom of movement is a human right. Even in a more just world, migration will continue, because families and communities are now connected over thousands of miles and many borders. Immigration policy should therefore make movement easier. To raise the low price of immigrant labor, immigrant workers have to be able to organize, an activity made easier by permanent legal status. Guest worker programs, employer sanctions, enforcement, and raids make organizing much more difficult. Today, the sector of workers with the fewest benefits and the lowest wages is expanding the fastest. Proposals to deny people rights or benefits because of immigration status make this process move even faster. A popular coalition might push back in the other direction, toward more equal status, helping to unite diverse communities. Such a political coalition might start by seeking mutual interest among workers in a struggle for jobs and rights for everyone. It is not possible to win major changes in immigration policy without making them part of a struggle for the goals of working class communities. To end job competition, for instance, workers need Congress to adopt a full-employment policy. To gain organizing rights for immigrants, all workers need labor law reform. Winning those demands will require an alliance among workers—immigrants and native-born, Latinos, African Americans, Asian Americans, and whites. An alliance with employers, on the other hand, giving them new guest worker programs, would only increase job competition, push wages down, and make affirmative action impossible. The basic elements of this alternative include permanent residence visas for the undocumented and new migrants, protecting family reunification, ending the mass deportations and firings, repealing employer sanctions, ending guest worker programs, demilitarizing the border, and changing trade policies that cause forced migration. A new era of rights and equality for migrants does not begin in Washington DC, any more than the civil rights movement did. Human rights reform is a product of the social movements of this country, especially of people on the bottom, outside the margins of power. A social movement made possible the advances in 1965 that were called unrealistic and politically impossible a decade earlier. An immigration reform proposal based on human and labor rights may not be a viable one in a congress dominated by Tea Party nativists and corporations seeking guest worker programs. But just as it took a civil rights movement to pass the Voting Rights Act, any basic change to establish the rights of immigrants will also require a social upheaval and a fundamental realignment of power. Read the rest of NACLA's Spring 2014 issue: "Mexico: The State Against the Working Class."